Air-fill two Rose Qualatex® I Love You latex balloons to 9". Tie together to form a duplet. Create a second duplet of the same. Twist the two duplets together at the knots to form a four-balloon cluster. Tie this cluster to the balloon weight. Air-fill two Rose Qualatex® 6" heart latex balloons. Tie together to form a duplet. Create a second duplet of the same. Twist the two duplets together at the knots to form a four-balloon cluster. Use the Adhesive Tabs to attach to the first cluster. Air-fill the 22" Love You Bubble. Use adhesive tabs to attach to the 6" Rose cluster. Air-fill two White Qualatex® 6" heart latex balloons. Tie together to form a duplet. Create a second duplet of the same. Twist the two duplets together at the knots to form a four-balloon cluster. Attach to the Bubble with adhesive tabs. 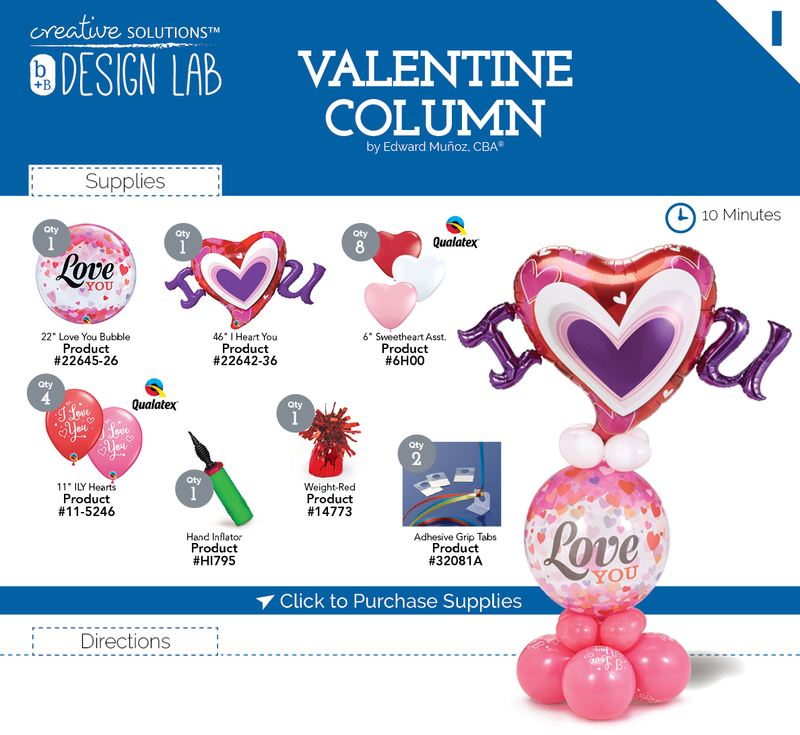 Inflate the 46" foil I Heart You with helium and attach to the last 6" White cluster as a topper. Copyright © 2018 burton + BURTON®. All rights reserved. burton + BURTON® cannot be responsible for any typographical errors or omissions. The liability of burton + BURTON® for defective merchandise is limited to the replacement of said merchandise, not any losses incurred due to the failure of the product. Products featured may hold either licensed trademarks or trademarks owned by burton + BURTON®. Build time contingent on proper equipment usage and skill.